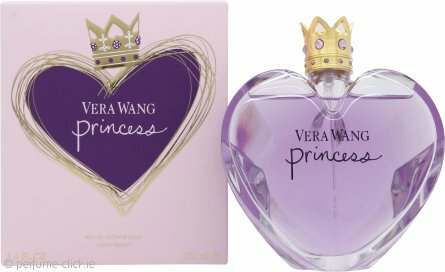 Princess by Vera Wang is a fruity and floral fragrance for women. This fragrance is one of Vera Wang’s best sellers. Due to its popularity, the designer has released more than one edition. Inspired by the modern day princess, there is one for every kind of girl available in the collection. Notes of a floral bouquet is evident in the mixture, sweetened with vanilla and an unexpected twist of pink guava and exotic fruits. The scent is bottled in a crystal heart shape with a gold crown cap that contains a hidden treasure: a keepsake gold band studded with tiny amethyst-coloured crystals. Princess was launched in 2006. Really love this perfume. Was thrilled when I saw it on this website! Really reasonable prices and delivered in less than a week! Very happy with my experience ordering from this website. Vera Wang Princess is an absolutely beautiful fregrance. A light daytime perfume. The bottle is beautifully designed.